Depending on what the weather is like where you live, you may find that it is easy to become dehydrated at this time of year. Most of us are pretty good about staying hydrated in hot weather- it is easy to identify thirst, and we are aware of our bodies losing water as we sweat. Cold weather can be a little deceptive in this way, and I know that I often forget to drink as much water as I need to to stay hydrated because I do not feel hot, or particularly thirsty a lot of the time. However, even in areas with high rainfall, the winter air can be dryer than the rainfall would suggest, and in cold weather, the use of indoor heating can contribute to drying out and dehydrating the body. Luckily, tea can help rehydrate the body. This is not to say that tea should replace your daily water intake. However, for those of us experiencing cold weather, and consequently who are not particularly inclined to down multiple glasses of cool water, a nice hot cup of tea can be the perfect thing to contribute to the body’s hydration processes. But which teas? Well, the good news is, mostly any tea will do. This is because tea is made up almost entirely of water– which is what we are concerned with when discussing hydration levels. As such, teas taken with milk or–in the case of traditional Indian masala chai–teas that have a milk base will not be as hydrating as teas served without milk. If you are talking about adding a dash of milk to black tea, then of course the difference will be minimal. But every little helps! 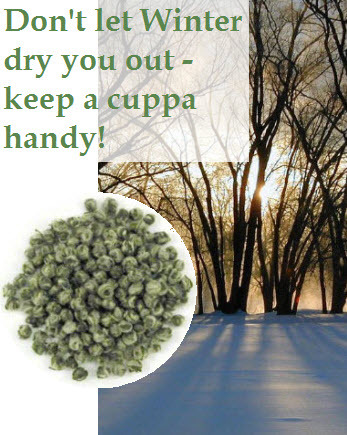 Another way in which tea can help with hydration is due to the tendency to sip it gradually over a length of time. For hydration purposes, sustained fluid intake over a longer period of time is usually more effective than downing a litre of water in one go, and, as such, having cups of tea consistently throughout the day is a good way to help yourself stay hydrated. The good news, for any finicky tea drinkers out there, is that there is not one type of tea that is especially hydrating, or better for hydration that another. So, whatever your tea preferences, feel free to imbibe all or any types of tea (along with your daily water intake) as you stay conscious about hydration levels during the winter months!